$18.95 USD 9.5 x 10 inches softbound. By Nature's Design invites readers to discover and appreciate natural patterns by noticing details a less observant viewer would miss: the sensuous ripples flowing water leaves in mud; the tracings of veins in an autumn leaf; the intricate cracking of tree bark; the colorful splashes of lichen on a boulder. Underlying the many modifications and adaptations of patterns that occur in nature is a hidden unity. Nature invariably seeks to accomplish the most with the least--the tightest fit, the shortest path, the least energy expended. Many of the photographs in the book were made in direct collaboration with the writer, so the images could best illustrate both the art and science of the patterns. 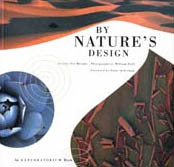 Enthusiastic praise for By Nature's Design came from a range of readers. Both Life Magazine and Outdoor Photographer Magazine excerpted images and text; Nature photography fans wrote fan mail; and several teachers contacted us to say how the book's material inspired them.